Some brands need no introduction; so much that even those not so passionate about the products they retail know their legacy. Take for instance the legendary Bullet, created by a company that has been a name to reckon with since 1901 and is synonymous with motorcycles the world over — Royal Enfield. Through the years, the brand has designed and manufactured the finest of motorcycles for its customers and patrons. 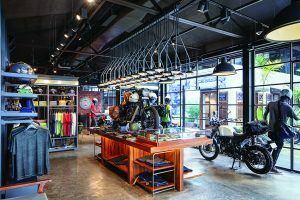 As an extension of the Royal Enfield experience, it introduced a retail wing some years ago which offers apparels and motorcycling accessories. 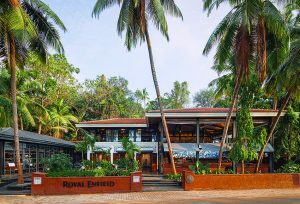 The subject of our story is actually the next level of “brand immersion” that Royal Enfield has planned — the company is set to launch highly-curated, larger experiences in key motorcycling destinations. These go beyond selling motorcycles and gear, into offering a space for the motorcycling community to congregate in and experience the Royal Enfield brand and its commitment to pure motorcycling. For this crucial new chapter, the brand turned to their trusted partner Studio Lotus — Royal Enfield’s retail design and architectural agency — who have successfully rolled out a series of stores for them across the country. 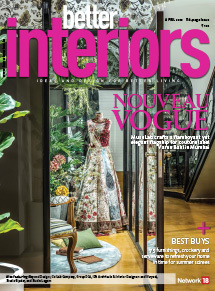 For the uninitiated, the popular New Delhi-based firm — co-founded by Ambrish Arora, Ankur Choksi and Sidhartha Talwar in 2002 — has a string of inspiring work to its credit and is a multi-disciplinary design practice which not only works on the largest of architectural and interior design ideas but also crafts the smallest of furniture pieces down to the last detail. Truly, this passion for design and their understanding of the pulse of the client is evident in the plan they had for Royal Enfield’s new offering. The facade of the Gallery space (read building) in the property is impressive and sets the mood for the nostalgia one would be drawn into once they step inside. 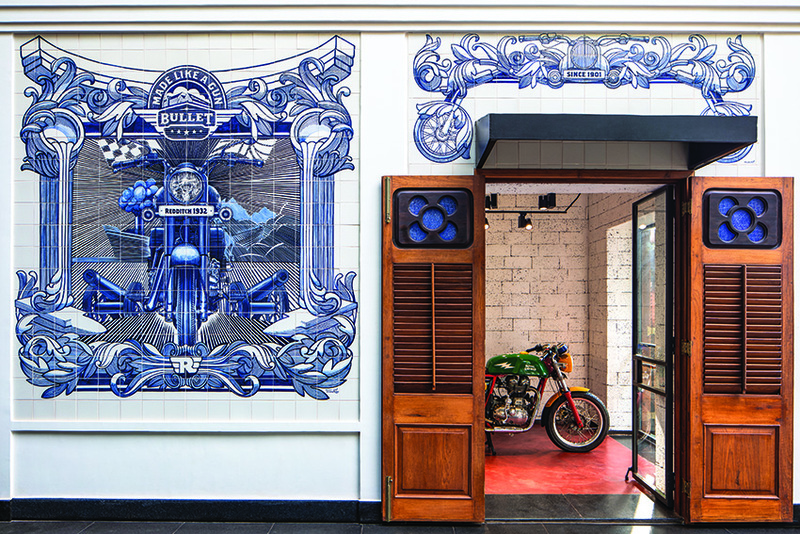 Studio Lotus delegated Goan artisans to create an Azulejos-inspired installation — depicting Royal Enfield iconography featuring the classic Bullet — designed by Codesign onto the wall. The artwork (a painting) was translated onto tiles by hand. Note the old teak wood doors with louvers and a floral-like motif. It was sourced from an antique store and restored to its original glory. “Our brief from the client was to create a destination space for Royal Enfield in Goa, which is a prominent route for riders in India,” informs Pankhuri Goel, principal designer, Studio Lotus. She further divulges that though the client had a fair impression of what this new venture could be and was toying with the idea of including a F&B outlet in this curated space, the thought of whether it should have a gallery or a retail outlet within its premises were concepts which developed as the project progressed. 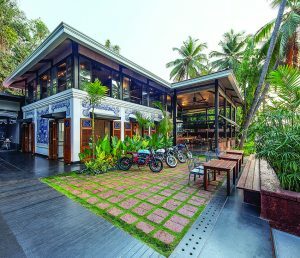 Things started falling into place once Studio Lotus entered the 11,855-square-foot area where stood the much loved, quaint Goan eatery at Baga Creek, J&As. “When we first visited, the restaurant was no longer operational. It was in a state of disuse but still had a lot of character as there was an old Portuguese house in the centre of the entire plot, which we retained in our final scheme. There were lots of trees and the boundary wall was very interesting. Both these elements also made it to the final design,” says Pankhuri when quizzed about how the site conditions were when they first saw the space. The first job which Studio Lotus dwelled on was the structural changes. They did away with the many temporary structures around the old Portuguese house and its remnants became the focal locus around which the entire project was built. If you visit the property today, you’ll see a seamless amalgamation of a retail space, a bar and restaurant, a gallery, a bike customization area and a service centre. The buildings which house these facilities are planned on a half-acre plot of land as a series of independent yet interconnected structures, each of which tells its own story. The bar and restaurant is bright and airy thanks to its double-height space. 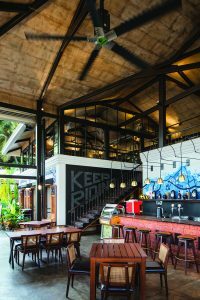 While the ceiling is crafted by using Goan cement pots, the floor is clad in concrete cement, and mild steel is the material on the trusses, staircase and railings. A slowly moving, high-volume, low velocity rotor mounted off the 20-foot-high ceiling ensures a gentle breeze in the space at all times. 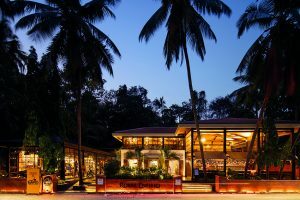 The industrially-crafted retail wing, with its zinc roof, laterite infill walls and the now distinctive “Royal Enfield” charcoal grey metal and glass facade, effortlessly bridges its Goan setting with industrial craftsmanship. The central traditional Portuguese-style structure where the old J&As kitchen used to be — the anchor of the project — has been converted into a multifunctional gallery. The space currently houses and tells the story of the Royal Enfield motorcycles — right from the 1939 Flying Flea to the original 1963 Cafe Racer — and other engines and replicas that form the brand’s rich history. A key talking point of the project is the facade of this particular structure which sees a specially commissioned artwork inspired by a Royal Enfield iconography. This Azulejos-influenced installation, which was created by Codesign, has been hand-painted on tiles by Goan artisans. Attached to this heritage structure is an exciting double-height space formed by a steel framework and a traditional Goan roof. These form the F&B part of the project, namely the bar area and the first floor lounge and dining space which affords incredible views of the Baga creek. The double-height bar volume has a hand-painted backdrop by Monde Art that takes the viewer through a meandering Goan road trip. Highlighted by customized brass headlight pendants, the bespoke sandblasted timber bar top brings alive Royal Enfield’s presence across the world. The piece de resistance of the lounge area is the bespoke wall installation by Hanif Qureshi of St+Art Foundation which features a collage of books in varied sizes that come together to form a Royal Enfield classic motorcycle. The first floor lounge wall has a dramatic installation by Hanif Qureshi of St+Art Foundation. 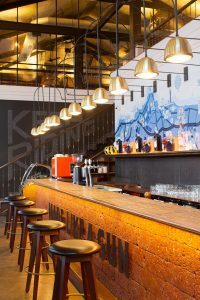 The whole ambience in the F&B space is consciously kept cosy and warm by lighting up the roof to allow reflected light to seep into its double-height volume. The tables and chairs used here were also judiciously selected. “Our intent throughout the project was to continuously look at Royal Enfield from the lens of the context where this project was sitting, ie Goa. Therefore, a lot of the furniture that we used was found furniture — we went to various antique stores, scrounged around and sourced furniture that could be restored and reused. On the other hand, there were also a lot of custom-made pieces that were more industrial in their aesthetic,” explains Pankhuri. 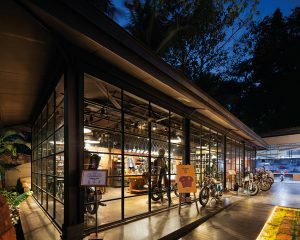 Flanking this F&B structure at the rear is a state-of-the-art service centre which accommodates a bike customization zone. This is a haven for enthusiasts who don’t have the resources or space to turn their imagination into reality as one can find all the essentials required to customize a motorcycle here. 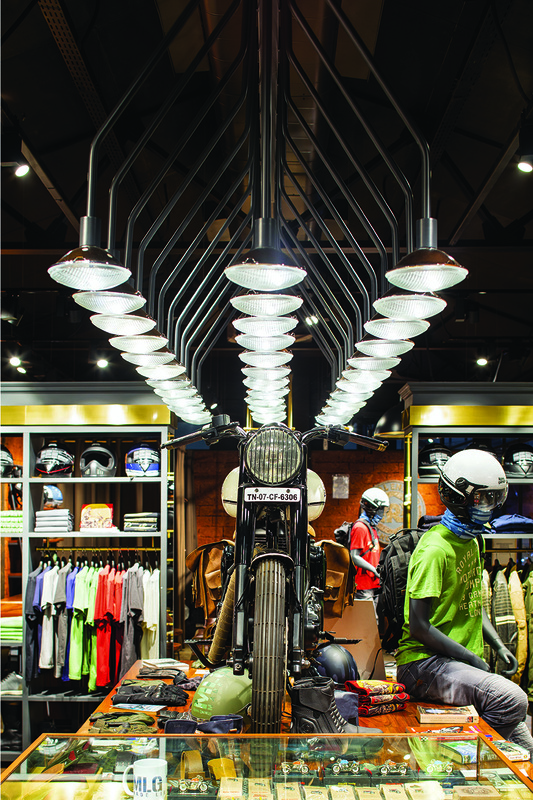 The retail area: a customized chandelier of sorts created using motorcycle headlights is suspended over a table which displays tees and other Royal Enfield accessories. 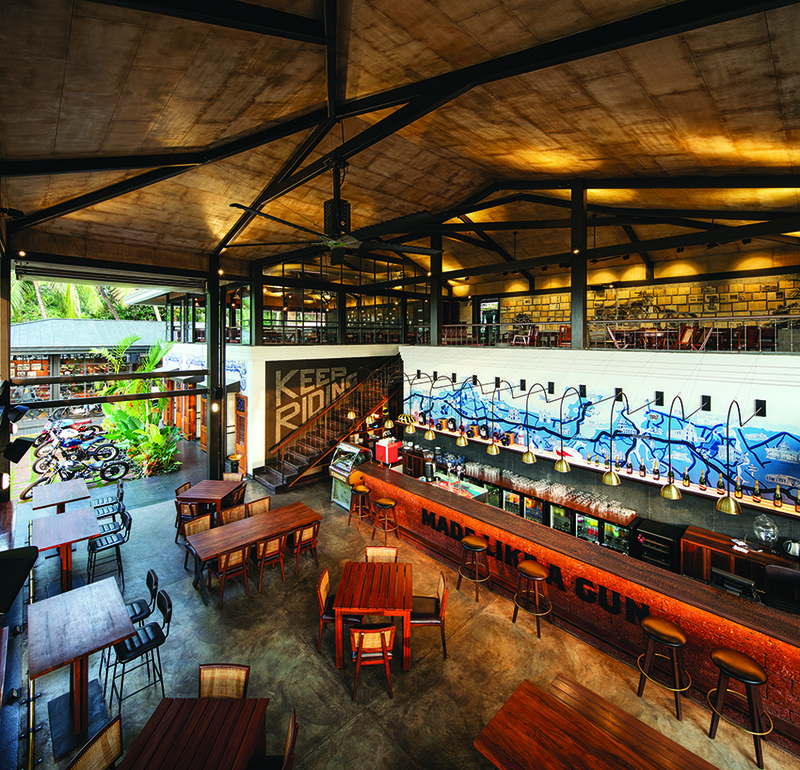 The Royal Enfield Garage Cafe is definitely one-of-a-kind in India and truly is a labour of love for Studio Lotus. “It took a long time to complete the project as the weather in Goa was a challenge. There were months every year where we could not get any work done because of its long monsoons. Whatever progress we had made would also change. For example, when we were digging the foundations, they sometimes used to get filled up with water,” reminisces Pankhuri. “And then getting the right contractor to execute the job was another challenge,” she adds. These roadblocks and umpteen obstacles the team encountered in their design journey have been worth it all. 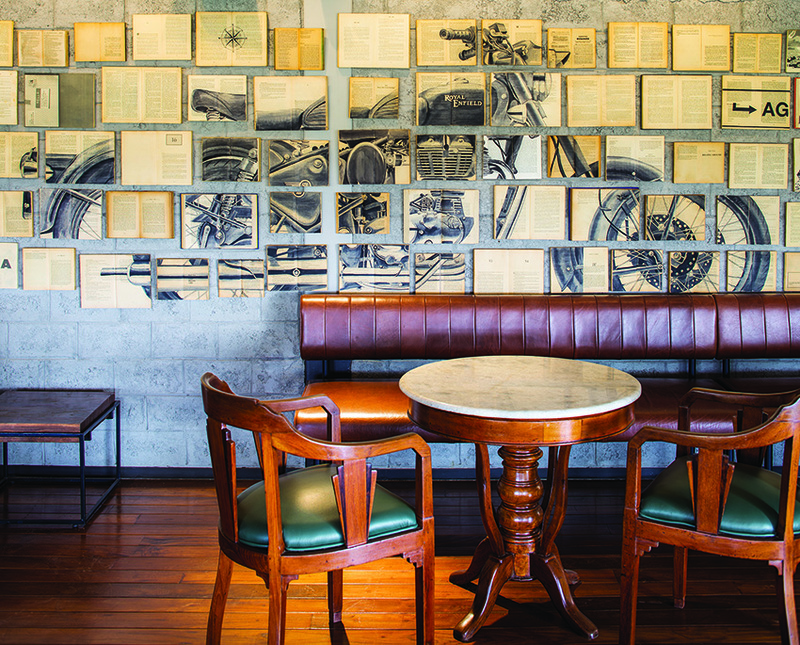 They have delivered what the client ordered — a charming Goan space, with a Royal Enfield heart. 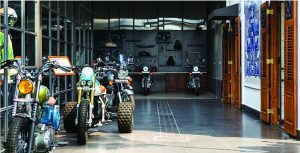 To create a motorcycling destination for the Royal Enfield brand, a place which would go beyond selling motorcycles and gear. A space for the motorcycling community to congregate in and experience the Royal Enfield brand and its commitment to pure motorcycling. No restraining gates, fancy signage or flashy hoarding announces the Royal Enfield Garage Cafe. As the property is located on an important road, and primarily because of the cafe, the design team wanted the site to be as visible and open as possible. 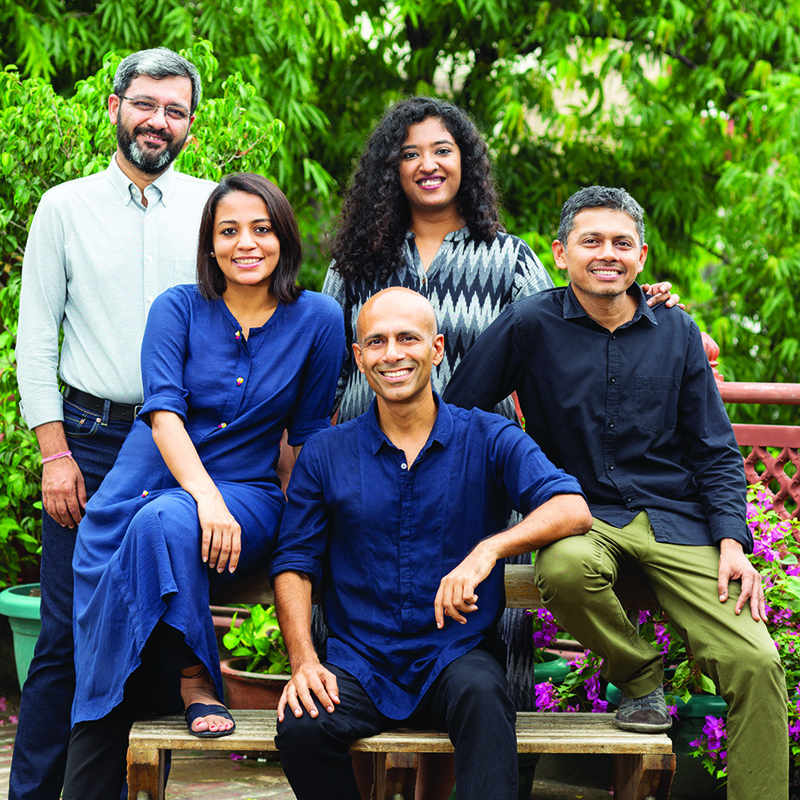 “We retained the scale and the language of the existing boundary wall because we wanted the memory of the site to remain as is,” says Pankhuri. In the courtyard, laterite stones were interspersed with strips of green on the floor. The walkway is lined with shot-blasted black granite. Patrons can enjoy a cuppa sitting on those old-world metal chairs which are accompanied by acacia wood tables. 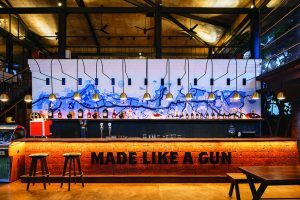 The bar counter is set against a striking hand-painted artwork created on the wall by Monde Art, which takes one on a meandering Goan road trip. 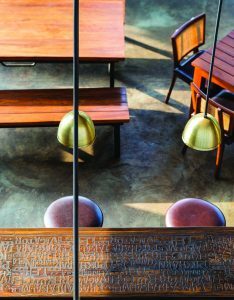 Customized brass headlight pendants hover over the bespoke sandblasted timber bar top. Why should the bar counter be left bland… the engravings on them tell the story of popular rider routes on the Royal Enfield circuit across the world. The double-heighted volume of the bar and restaurant space could easily contain a mezzanine floor which made way for a laid-back lounge space, a contrast to the high-energy ground floor bar area. Apparently, this is where most of the found furniture finds place. Some part of the old Portuguese home was revived and converted into a multifunctional gallery. 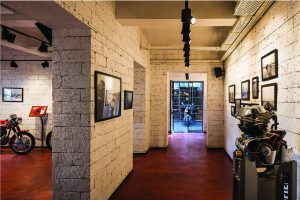 Featuring red oxide floors and laterite painted white walls, the space is a museum of sort for lovers of Royal Enfield motorcycles and other engines and replicas. The service centre also lodges a bike customization bay. This functional place (which can be rented for a day) is equipped with all the tools and equipment one would require to customize their motorcycle. Most definitely a biker’s paradise. 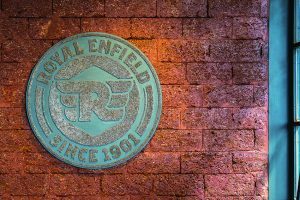 Studio Lotus was instrumental in creating a retail identity for Royal Enfield which is seen in all their outlets throughout the country. 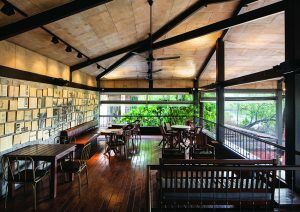 However, for this outlet, a little Goan twist was added to the design in the form of a zinc roof and laterite infilled walls. However, the distinctive Royal Enfield charcoal grey metal and glass facade stayed put. At the cash counter in the retail wing, a commissioned artwork of the Royal Enfield logo, and its birth year was created using innumerable nuts.